Grab a pink paper lei – this ice cream tastes like a Hawaiin vacation! Or as I imagine it anyway, since I’ve never been to Hawaii. 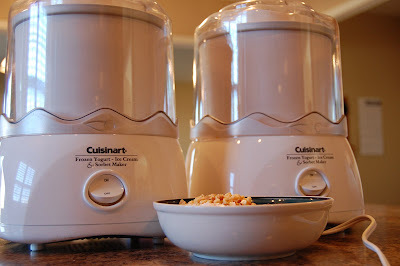 Homemade ice cream is easy to make, especially if you have a Cuisinart countertop ice cream maker. 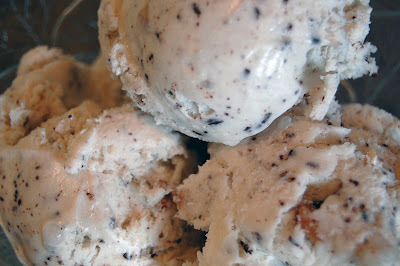 But even if you’re using a regular ice cream maker with the ice and salt, you’ll want to try this. a handful each – coconut, macadamia nut pieces, chocolate shavings. The mix-ins should be approximately 1 cup all together. This amount will make 1 Cuisinart freezer full. If you’re using a regular freezer that makes a gallon, you’ll need to double the recipe. You may also be able to use more than 4 cups of half & half in a regular freezer, but that should still work. You just get more ice cream. Keep in mind that the ingredients in the bowl are for two Cuisinart freezers, or the amount you would use for a regular freezer. Use half that if you’re only making one Cuisinart or similar freezer. I found the macadamia pieces in the baking aisle. I was going to buy almonds and they do taste good in this ice cream, but I couldn’t pass up macadamias. For the chocolate shavings, I used 1 square of semi-sweet chocolate. (Two if you’re doubling) I put it in the microwave for about 5-10 seconds, just to make it a bit softer, but not melted at all. Then I shaved it with a vegetable peeler. I’m sure there is a better way to get chocolate shavings, but I dont’ know what it is. I don’t use the whole square of chocolate. It becomes too hard to hold onto without shaving my fingers. I told you there must be a better way. If you know it, please tell me. 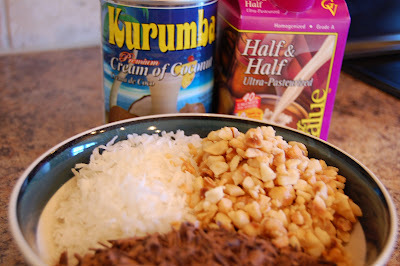 Stir the cream of coconut, half & half together. Pour into the freezer and follow your freezers directions. 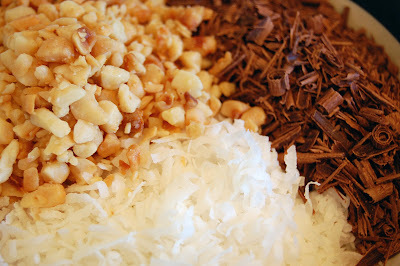 A few minutes before the ice cream is done, add the nuts, coconut and chocolate shavings. You can eat this right away, or put it in a container and freeze it for later. Some home made ice creams can be very hard after they are stored in the freezer, but this one dips easily. Normally, I have no self-control when it comes to ice cream but I made this especially for my Dad and I haven’t eaten any of it. Well, if you don’t count licking the spoons and scraping down the sides of the freezers. I even poured the scoops I photographed back into the container. It will be packed on dry ice and carted off to Dad this weekend. I hope he’ll share. Stir cream of coconut and half & half together until well blended. When ice cream is nearly done freezing, add the other ingredients. Serve right away or allow to harden in freezer. Darn it! Now my desk is all wet from drool. And, I’m pretty sure I gained like two pounds just from looking at that yummy ice cream. Tiffany, that looks so yummy… I can hardly stand it! Thanks for stopping by my Doggie Life.SITS is so cool. I’m a homeschool Mom too… yeah us!!! YUM! im drooling here just thinking about this…. Holy freaking yum! This looks amazing!!! I am totally wanting to try this! Thanks for stopping by my tipsy site for UBP! MMM, this ice cream sound soooo delicous!! So tropical and vacation -like!! I would love to try it! You are so amazing! I want to try that. Looks so delicious. My kids will love this. Thank you for sharing! Thanks again for commenting, and I hope you’ll visit again! yum! my husband would love this flavor! Tiffany! THank you for stopping by The Glen…this ice cream sounds DELICIOUS!!!! Oh man there is nothing like homemade icecream. The best I ever had! That icecream looks sooo yummy. Thanks for sharing. Thanks for stopping by my blog. Have a great weekend!! WOW! I LOVE the classic tropical combo of coconut and macadamia! this would be dangerous in my kitchen, too. I’ll probably finish the whole batch and suffer the consequences in the bathroom! That sounds really good and I wish I had an ice cream maker. Only one thing, though, I don’t like coconut. I bet you’ve tried other ice cream recipes too. Thanks for sharing this one. Be still my heart! I can’t wait to make this! Oh my gosh….that looks so yummy! Oh, and I have one of those ice cream makers (but in blue)! Bethany, sorry to confuse you. I made 2 freezers full, so the amount of mix ins in the bowl is for 2 freezers. To make 1 freezer you’ll need about 1/3 cup each of chocolate flakes, nuts and coconut which would equal 1 cup. I finally made this a couple weeks ago and was kinda disappointed. I don’t know if I’d worked it up too much in my imagination or what. It wasn’t bad, it just wasn’t great. Ho-hum ice cream is still good simply because it’s ice cream (and you know how much I love sugar! ), but this has some spendy ingredients that make me want it to be amazing. Bethany, I’m sorry it didn’t meet the expectations. I’ve had that happen with recipes myself sometimes. This one is a favorite of my Dad’s, but that doesn’t mean it will be everyone’s fav. Thanks for trying it and letting me know what you think! I made this last night for a family Sun. dinner. I used mini chocolate chips. Two thumbs up from everyone! I just wanted to thank you for posting this recipe! 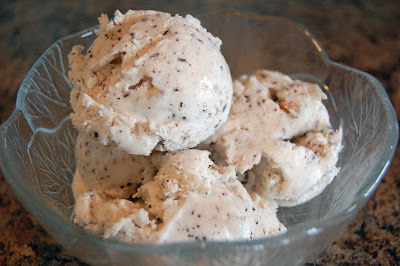 (I saw it on tasty kitchen) It is the easiest ice cream recipe I have ever tried and is absolutely divine!!!! I will be putting this one into heavy rotation, thanks again!!!! Andrea, I’m so glad you like it. I’m all about easy cooking! I just made this last week and posted it on my blog today with a link back here. It’s AMAZING. Might be my FAVORITE home made ice cream so far!! Thanks! I made this last night for a Beach themed Pokeeno night. It got rave reviews. I loved that it was super easy and while a splurge, not terribly expensive to make. One thing I would tweak….you really need to make sure the macadamia nuts are toasted first. I have a couple of tweaks I’d like to makke simply for my own personal preferences, but this was definitely a winner! Oh, and I would add that I served this alongside crockpot pineapple upside down cake. So ono! Curious can I make this using the ice cream attachment and my kitchen Aid mixer? Any adjustments to the recipe? I think so. I think those are about the same size as the cuisinarts.